Up until 1990â€™s, there was nearly no research done on the pineal gland, in other words, our third eye. An ancient knowledge long forgotten, or neglected, resurfaced with the tireless efforts of a British scientist Jennifer Luke who published the results of her research proving that the fluoride deposits were accumulating in the pineal gland causing it to calcify and thus causing many mental and physical illnesses. Most importantly, fluoride decreases melatonin production. Why is this important? Consume foods rich in iodine like, seaweed, Himalayan salt, fermented foods. Increase your selenium intake by eating, nuts (Brazil nuts mostly) together with other foods that are high in vitamin C.
Now letâ€™s take a closer look at what actually fluoride does to our pineal gland and how it impacts us spiritually and mentally. 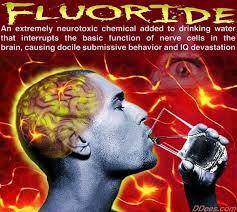 Fluoride is now being recognized as a neurotoxic chemical that affects our developmental health. One of its side effects is lowering the IQ levels in children and also causing ADHD. When we consume products that contain fluoride, it goes to our blood stream, finds its way into our bones and pineal gland. Especially in pregnant women, this can be a risk factor as it plays an important role in brainâ€™s development. As we mentioned above, fluoride was highly used by the Nazis to keep the prisoners passive in concentration camps. This results in decreased learning capability and poor memory. When our brains are not able to function properly, we are more prone to autoimmune disorders, a weakened immune system and poor physical health. Mind and body go hand in hand. If one is suffering the other will not be able to fight the stress. Fluoride also lowers our energy levels. When we donâ€™t have enough energy, our metabolism slows down, instead of consuming healthy foods (because they require us to prepare them and since we lack the energy to cook we go for the fast and unhealthy options), we eat processed foods. Of course we donâ€™t have to start counting the bad side effects of a diet that contains mostly processed foods, sugar, bad carbs and bad fats. The whole thing is a chain reaction if you will. Before we know it, we are part of the weak masses. All these health issues we talked about will reduce our ability to achieve spiritual growth. This is the most important part of the problem. If you think about most of the medications prescribed for a wide variety of diseases including depression and anxiety, they contain high levels of fluoride yes, but they also contain synthetic hormones that temper with our brainâ€™s natural ability to produce these hormones. Once we introduce synthetic hormones to our bodies, our pineal gland loses its function. When we close our eyes, we can not see, this is a simple fact. Our pineal gland is our third eye. When it is damaged, our third eye is also closed. This is the mindâ€™s eye, our path to higher consciousness, spiritual awareness and self awakening. No amount of meditation, efforts of positivity or spiritual practices can help us go any further if we donâ€™t deal with the source of the problem. If you ever find yourself helplessly meditating but not making any progress, trying to do all you can to open your third eye chakra to no avail, if you can not improve your physical and mental health no matter how hard you try this is why. Because you are overlooking the most important step in the process. But now that you know where to start and which steps to follow, make a good plan for yourself including a healthy diet along with exercise and meditation. There is no doubt this was a long lost knowledge because we have now a lot of historical and archeological proof showing that almost all ancient civilisations were aware of its function and its role in spiritual awareness. We are now rediscovering this long lost secret. In ancient civilisations, pineal gland was associated with powers like psychic abilities, supernatural powers. It was also associated with sexuality, bodyâ€™s biorhythm, mysticism, intuition or sixth sense. Today, we also call it the sixth chakra. Now, science shows us what our ancestors knew centuries ago was in fact true.